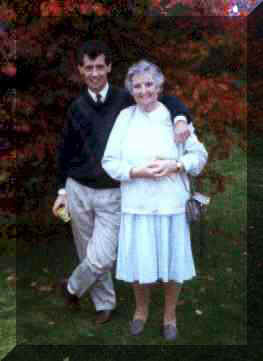 As her eldest child I had the privilege of paying tribute to mum at her funeral service on August 28th 1999. It is reprinted here in her honour. .
"We are so proud of our mum. We are a very close knit family and it was she who glued us together. When God was handing out mums I really do think we got His very best. She was always full of life. And full of pranks. Those who know our family know that we inherited her love of water fights. Our family water fights are the stuff that legends are made of. Only this year neighbours saw me  a grown man - climb over our roof with a bucket of water in order to score a major hit on our daughter who was in full battle with the hose from the safety of the top of the steps at our back door. And most of the water fights were started by mum. All in all, she had a great life. We knew it, and she knew it. But she knew the days allotted to her were lessening in number, and so she set her house in order. She left us a short letter with her choice of hymns and scripture. She even left instructions for her beloved cat. Yes, our mum had a great life. But she always expressed one continual regret. That she was not being used by Jesus. she was doing nothing of any value for Him. You see, true unconditional love is a hard concept to understand. We saw other children grow up trying to measure up, and that always robbed them. We grew up with true unconditional love which always brought affirmation and life. We grew to believe that, whatever it was, we could do it! Thanks mum! a painfully shy little two year old girl being raised in a childrens home in County Wicklow. I think true forgiveness is a hard concept to understand. But we understood it, for we were raised in this clean air. Many a time we blew it big time and yet every time we received real forgiveness. Her forgiveness had only one condition. That we in turn forgave others. Loving justice.. and yet extending mercy.. is also a hard concept to understand. Not for us however, for we drank deeply at this well also. Gods Word was her plumline in life, and yet, without once ever compromising truth, she extended life giving mercy. As one of the family said with many tears this week. - but she never told anyone else". Pouring your life out for another is a hard concept to understand in this me  first world. But again, not for us - for we saw her pour her life into our needs and pains and sorrows time and time again. When one of us hit hard times she quietly handed over her lifes savings leaving herself only her pension. When my first wife died aged 23 she virtually raised Scott for the next five years. When ten years ago I went through a very distressing year she was took me back into her home and weaned me back towards full mental health again. Night after night, often into the small hours of the night she sat up listening to my ramblings. Every time I fell into the black hole she picked me up. I can safely say that almost everyone - doctors, church, family and friends - all thought that mentally I was a goner. But she said afterwards she always knew I would make it back on to my feet. It gave her great joy to see Jesus then take those dark days and use them in my life for His Glory. She would have died for any of us and we always understood that. Unbreakable, unshakable faithfulness is a hard concept to understand in todays world where something only stands when it is signed and sealed in a legal document. Not for us. Her word was her bond. Honesty and integrity and faithfulness were her hallmarks and this was the soil we were raised in. And of course we in turn now try to raise our families in the same soil. Making Jesus absolute Lord in every area of your life is..perhaps.. a hard concept to understand. But never, never for us. For Jesus was first, second and third, and then came us and the grandchildren. In her letter to the family nothing had changed. She wrote..
She was no luke warm follower of Jesus. She never watered down the Gospel. She knew that your goodness never brought you into a saving relationship with Jesus. He was either Lord..or He was not. It was total surrender or it was nothing. She wrote in her letter..
Is it any wonder we too love Jesus? But youre one hard act to follow. See you in the Lords perfect timing."